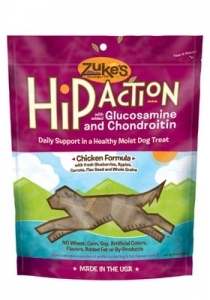 Hip Action is now available in CHICKEN! 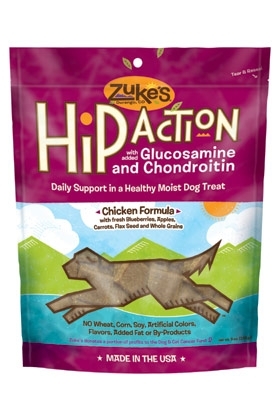 As always, Zuke's uses USA sourced chicken, as well as fresh fruits and veggies, whole grains, flaxseed, and cofactor vitamins & minerals for maximum absorption. Dog Treats with Glucosamine & Chondroitin • Each dog treat contains 300 mg glucosamine and 50 mg chondroitin • Easy to feed your dog – no messy pills or powders • Contains essential cofactor vitamins and minerals that aid in absorption • Made in the USA • Wheat, corn and soy free.